It was still dark when we arrived at the dock, there was a stiff wind out of the east, and it was January. The best part is that we were in Islamorada and that means no wind chill factor.I just love it down here. We chatted by the transom and soon the mate arrived. He helped us aboard and began preparing for our offshore trip. The word “offshore” down here means essentially the same thing as it does up north, the difference being travel-time. Instead of going 20 to 100 miles offshore, a 15 mile ride is considered “way out there” because billfish, tunas and their cousins are often caught only a couple of miles from the beach. The captain, showed up a little while later and soon we were heading out past the exposed sand bars that would later be the site of afternoon beach parties. After a short ride, we were over the reef where we began to chum. The mate broke out little freshwater outfits rigged with a bobber and a small hook on a leader. The target was ballyhoo. These little “upside down” billfish make wonderful bait because they are so hardy. Everything likes to eat them. We were actually having fun catching them and tossing them into the livewell. Just as I wondered how many we would need to catch, The mate came to the transom with a cast net. Part of the plan was chumming and catching them by rod and reel because this drew them nearer and nearer to the boat. An interesting thing to note is that every time a gull or tern passed overhead, the school would move away again. Finally they were just the right distance and we watched the mate, precariously perched with one foot on the transom and another on the fishbox, toss that net farther than one would expect. Up came the glittering ballyhoo as the engines started and our adventure began in earnest. We trolled 4 baits as we made our way offshore. The plan was to go “Sailfish Pitching”. This is quite an exciting game. You troll around until one comes up in the spread or you spot one swimming. Then the captain maneuvers the boat; a live ballyhoo is hooked in the lower lip behind the beak and pitched at the fish. Light spinning tackle is used. It wasn’t too long before we spotted a sail cruising down sea in a wave of the purest aquamarine one could imagine. I grabbed a bait hooked it on and lobbed it about 50 feet toward the sailfish. I “popped” it once like a plug and then opened the bail as the ballyhoo dove. The sail dove right after it and a moment later, line began to stream off the reel. I closed the bail, the line came tight and a beautiful blue and silver missile skyrocketed out of the water. This was the first fish on a brand new outfit I bought in anticipation of this trip, a 7-foot graphite spinner loaded with 10-pound test. The fight was exciting. The fish jumped and tailwalked several times, expending its energy in this manner rather than running straight away. 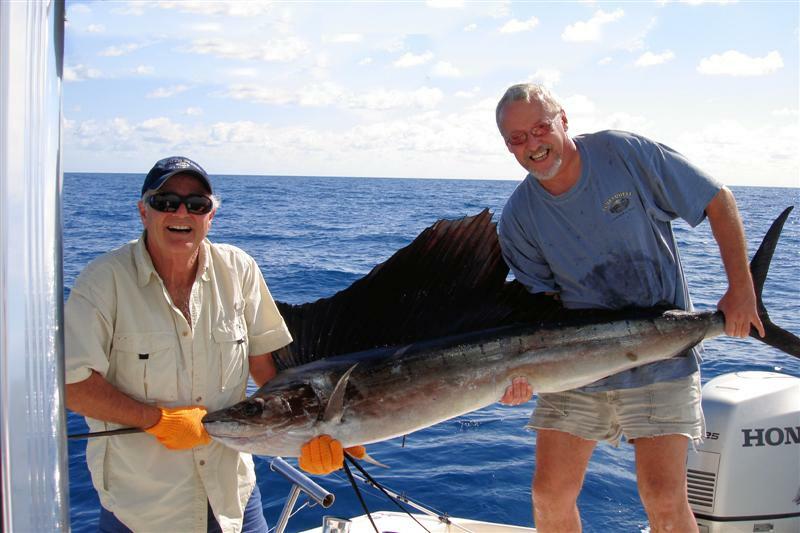 This style of fighting makes Sailfish a great light tackle adversary. The visual thrills are awesome. After a while I finally led the fish toward the boat, but it still had some aerobatics left and used them only 10 feet from the gunnel. Wow! Finally the leader was in hand. The fish was posed for a picture, revived alongside the boat, and released. My day was made and it was still early morning. We started troll/searching again and enroute picked up a couple of nice Jacks. Boy can those things fight. Mickey landed a beauty, estimated at about 40 pounds. That fish made a serious mistake going after her line though, because as slightly built as she is, this woman is formidable. Not many miles passed by when we spotted a couple of Sails cruising in the face of a wave. I cannot do justice in words to the beauty of the water down here. You look into a 4-foot wave coming toward you and see a rich blue wall with the sunlight shining through. In that wall of water it is easy to spot a 6 foot fish with a glow of its own. Alec grabbed the spinner and tossed a live ballyhoo into the wave. The fish didn’t have to be coaxed. The sudden presence of a struggling, “delicious” hors d’oeuvre sharing the same wave was more than the sail could endure. Pounce!! 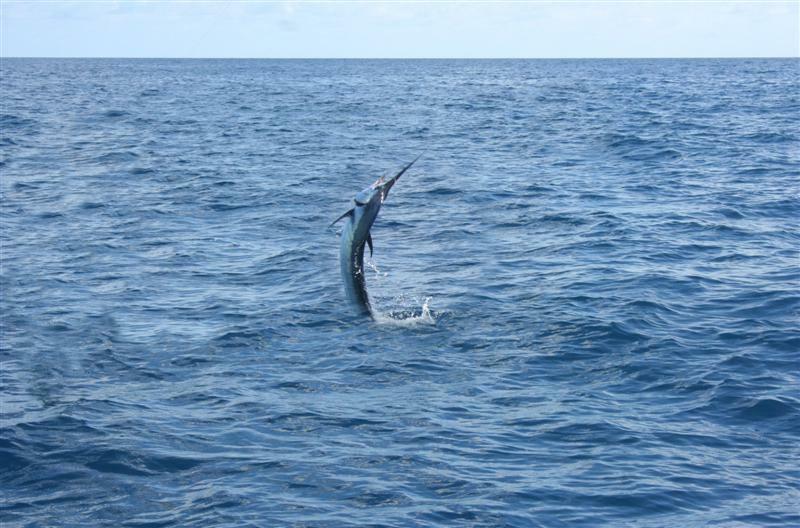 The ballyhoo bit back via the very sharp hook in its bill and the Sailfish demonstrated its surprise by launching into a series of Olympic quality acrobatics but to no avail. The drag screamed, the engines roared, the spray flew, and the fish lost. After another very exciting fight on 10-pound test, a beautiful sail had been “billed”, photographed, and released. Flag number 2 went up the outriggers. The trolling pattern went out and we began another search. We cruised around for about an hour watching the water and watching the sky for birds. The captain spotted a frigate or man-of-war bird and headed toward it. They are an excellent indicator because they will follow large predators, waiting for them to feed and drive bait to the surface where the birds can get at it. Sure enough, under this jet black bird there was a sailfish. The captain turned the boat to give me a clear shot and I cast out the bait. The bail closed just as it landed in the trough of the wave the sail was traveling in. I popped it hard and then reeled and popped, reeled and popped. The sail literally shot out of the curl of the wave and traveled about 10 feet in the air, landing on the hapless baitfish. I struck the fish 3 times quickly and it registered its surprise with a fantastic aerial display. Streaks of neon blue stood out as its colors deepened, indicating the adrenaline surge it must have been experiencing. After a wonderful battle another flag went up and so the day went, one adrenalin-pumping encounter after another. By day’s end we had 6 release flags flying and we had fought a handful of jacks too.